The reputation of skyscrapers–all that water use! CO2 emissions!–is pretty dim. But these towering beauties prove that green doesn’t have to mean unsightly. For World Environment Day, we created a sustainable skyline of some of the most eco-friendly superstructures on the globe. This 57-floor triangular tower features a central atrium that, on nine different levels, opens to the skies on one of three sides, forming sky gardens that embrace natural light. Venture to the roof and you’ll find a habitat for endangered peregrine falcons. Currently under construction, this tower is being built with lungs–three open voids in the upper half of the structure will breathe natural light and clean air into the building’s energy system, reducing the need for artificial cooling and lighting. Built in 1962, the Cooperative Insurance Tower was retrofitted with 7,000 solar panels in 2005, making it the largest vertical solar-energy project in the U.K. With 24 wind turbines housed on its roof, the building supplies 10% of its own energy needs. 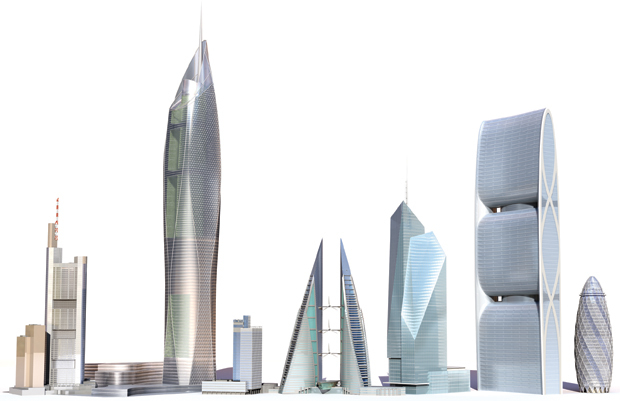 Both an environmental and a design first, the Bahrain towers are connected by three 95-foot propellers, delivering 1,100 megawatts of power to the 50-floor structures annually–enough to supply 300 homes for one year. At 58 floors, Bank of America’s home base takes green skyscrapers to a new level. The first LEED Platinum-certified tower in the city, the sculptural masterpiece uses waterless urinals, which help save 8 million gallons of water each year. On track to be completed later this year, this tower will be the world’s first zero-energy skyscraper, supplying all of its own power needs–and then some. The extra energy, generated by solar panels and wind turbines, will feed electricity into local power grids. Bike storage, gas fuel, and that conspicuous building shape are just a few factors that make the Gherkin environmentally friendly. The coned structure maximizes natural light and ventilation, allowing the tower to function on half the energy of a similarly sized traditional office. A version of this article appeared in the June 2011 issue of Fast Company magazine.